While the biggest day in football is still a few months away, if you’re a diehard football fan, it is never too early to start planning your Super Bowl day. If you are going to be in the greater Plano area this year instead of at home, you might be a little uncertain as to what you should do to make sure you’ll still be able to enjoy the game. At Studio 6 in Plano, we want to make sure that all of our guests are comfortable and happy, which is why we are writing this blog entry — everyone should have options to watch the year’s most important game even if they are travelling. Our extended-stay hotel has everything you need to make any business or personal trip more comfortable. When you need a hotel room that is set up for longer stays, with more comfortable furniture, larger rooms, full kitchenettes, and the other amenities that will make any trip fly by, trust Studio 6 to score a touchdown every time. Call us today to book your room with us. This is Texas, which means that even if neither of our teams (Go Cowboys! Go Texans!) make it to the Super Bowl, most of us are still going to be watching the game. 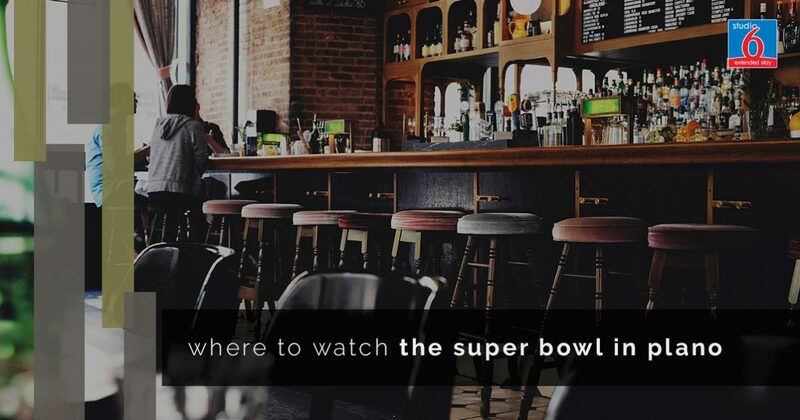 The dedication of football fans in Texas can’t be matched, which is why it is always easy to find a great sports bar where you can enjoy the game. Whether you are meeting friends or you are going to make new ones while watching the game, there are few better ways to enjoy viewing the biggest game of the year. If you are in Plano to visit friends or family, make a plan to watch the game with them! Even if your family and friends are not that into football, everyone likes watching the Super Bowl, even if it is just for the commercials. Make sure to have plenty of food and drink on hand so no one has to leave in the middle of the game to resupply, and don’t forget to wear your jersey or other good luck charm! If you’re in town on business and you don’t feel like braving a bar, grab some snacks or order some wings and watch the Super Bowl in your room at Studio 6! Each room has a big TV with great resolution, and our furniture is so comfortable that you’ll almost feel like you’re at home. Best of all, if you have an enthusiastic touchdown celebration, there won’t be anyone to get in your way! When you need to book a clean, comfortable room in Plano for an extended period of time, make sure to give us a call at Studio 6. All of our rooms were recently remodeled, and we always take the time to ensure that every one of our guests has what they need. Check out the rest of our site to learn more about our extended-stay hotel.